It’s been several months since the Un/Conference—remember that, back in November? We proposed Open Space sessions, ate Golden Thyme sandwiches, and considered the myriad ways we could envision the future as a moldable “How,” not an inevitable “When.” We looked at our roles in co-creating that future, plus the challenges and opportunities that we’ll face along the way. Do you remember the improv games, the data wrangling, and the Data Shark at the Inquiry Lab? We learned that inquiry is a powerful tool for dreaming, planning, and walking into the best possible version of the future. Just like an engine, inquiry powers our questions, imaginations, and impact. And, like an engine, it benefits from regular care, inputs to keep things running smoothly, and the occasional spark of inspiration. In the spirit of keeping our engines running, here are simple questions you can ask yourself. Each comes with a bonus to take it even further. We’ll start the conversation with two questions now, and continue with a couple more in Part II (now posted: Sparking insight: Part II). 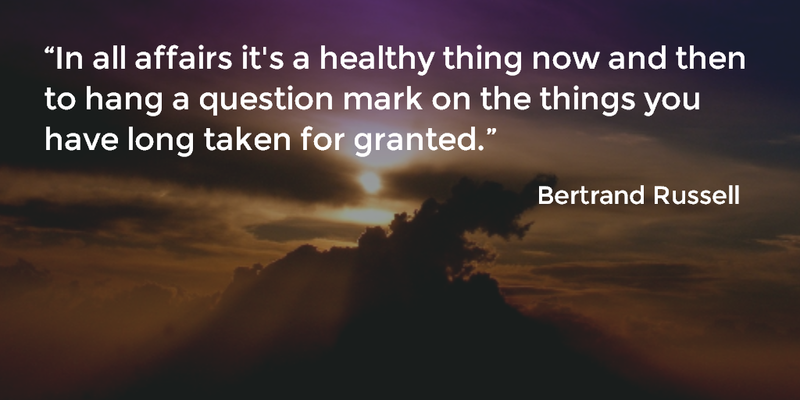 Bertrand Russell, a Welsh philosopher, said, “In all affairs it's a healthy thing now and then to hang a question mark on the things you have long taken for granted.” It’s easy to grow comfortable with a process, habit, or way of thinking. The next time you do something routine—from to sitting in the empty row of an auditorium instead of next to a stranger, to opening Facebook as soon as you wake up—ask yourself: What benefit does it bring me? What trade-offs am I making in order to do it? What if I did it differently? Bonus: Go a step beyond the thought experiment and take your question into the realm of action: Try a different approach and see if it affects your understanding of why. 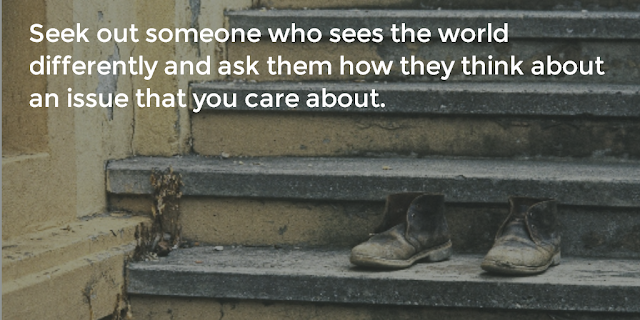 Step compassionately into the shoes of another person and consider how they might think about an idea. What values would drive their thinking? What assumptions might they make? What assumptions might you make about them? If you aren’t sure where to start, try choosing a topic or question and explore how another person might answer it. For example, what would a custodian who works 30 hours per week think about a decision to improve health insurance coverage for part-time workers? What might an executive think? What about the children of those people? Where would they converge, and where might they differ? What might lead them to their respective conclusions? Thinking critically about why someone might come to a different conclusion helps us discern our own opinions, motivations, unconscious bias, and framing. It can reveal gaps in our reasoning, leading us to change our position or strengthen it. If we find that our reasoning holds strong, this practice can help us explain it to someone who thinks differently. Bonus: Seek out one of those people who sees the world differently (they're all around you!) and ask them how they think about something you care about. For example, if you work in organizing for equity in education, choose five people you don’t usually discuss education with and ask them questions like, “What do you think of education in Minnesota? Does it work for you? Do you think it is working for everyone? What’s the point of getting an education?” Listen to what they say. Consider thinking about their words for a few minutes, hours, or days before responding. In Part II, we’ll look at the science behind our perspective and how changing the world starts with examining our expectations. We’ll consider how inquiry can help us to prioritize and begin taking action. In the meantime, please consider joining Minnesota Rising on Monday, June 11 from 5:30pm - 7:30pm for an update from Matt Lewis of GREATER MSP at Surly Brewing: A Strategy Manager for GREATER MSP, Matt works with cross-sector partners and external stakeholders to develop and implement regional economic development strategies. He'll provide an update on the Make It. MSP. campaign and share opportunities for joining the effort to help attract and retain talent to the region. Let us know to save a seat for you at minnesotarising[at]gmail.com! 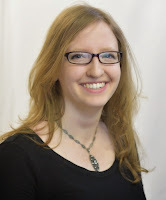 Ruth works at Minnesota Compass, a project led by Wilder Research. She asks a lot of questions and she enjoys walks, dancing, and playing the guitar. She's a member of YNPN Twin Cities. Find Ruth on LinkedIn or Twitter. Images: Created with Pablo using pictures from Pixabay.